Omron switches are the common by far used in mice, however the naming scheme and rumors abound about what each does and is. Here I'll try and document as much as I can and dispel some of the mysteries. This took hours to compile, reading websites, pdf's and more, it contains all you should need to know. Omron uses two naming methods. While I have not confirmed it, I suspect the numbers are different simply because one number is meant for a machine to install while the others are meant for individual sale/retail. The machine ones probably come assembled in trays or strips so the machine can feed them in quickly. 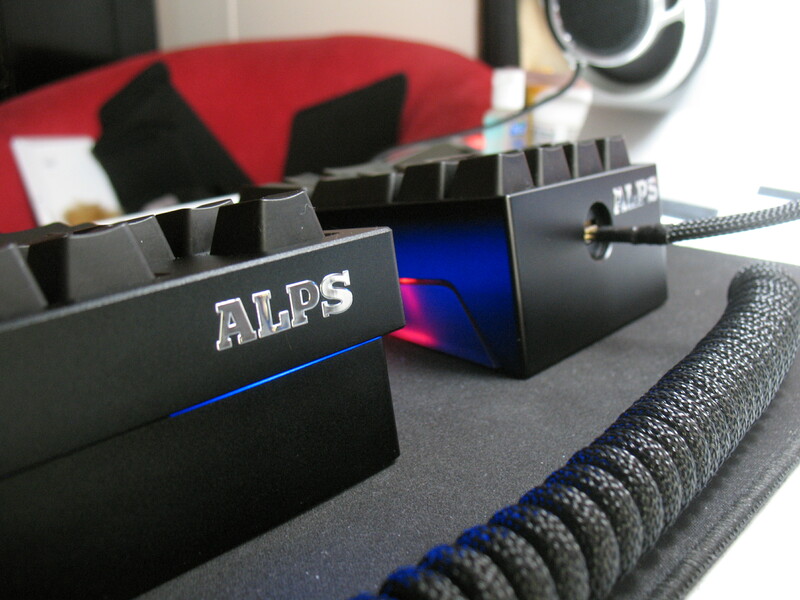 This is backed up by the Asus ROG Spatha mouse which uses a machine numbers on the switches inside the mouse, but retail naming on the two switches included (this mouse allows the user to change them). This guide covers both, but right or wrong about naming reasons, this is how they will be referred to in order to distinguish them. The switches by Omron are all designated D2F, from there it gets a bit more complex. We'll discuss retail switches first, as once you understand them, you can more easily understand the machine switches. Chinese models are mass produced and are considered to be a bit sloppy in tolerances, so one may have an actuation point a bit higher than another. Tolerances on these are pretty small so you wouldn't notice, but just know that they are more sloppy than the Japanese models. Japanese models have much nicer internals, better tolerances, better metals,a stronger frame and are better sealed from dirt and moisture. They are also slightly taller and have a shorter actuation distance, it's for this reason they are not always interchangeable with Chinese models. No question, the Japanese switch is better made, but unless you use it in a harsh environment, or plan on your mouse lasting 10 years or more it may not be worth the added expense or hassle to install them. Warning: If your mouse has Chinese models, the Japanese models may not fit (unless there is a teeny bit of slop between button and switch itself, which is common). Most Logitech can probably handle it, but if not you can always file actuator. Just remember if you don't like it and try to go back to the Japanese version things will be very sloppy. The next batch of numbers or lack of them is usually an 01, this indicates the spring material. I put them in quotes because I suspect it means they are plated spring steel, not an actual alloy of the two materials as implied by Omron. Gold is better at fighting corrosion, however it doesn't conduct as well and needs a bit more power to start conduction. In our situation, it doesn't matter much and given time and corrosion (tarnish), the gold will maintain it's level of resistance better. So unless you need the added conductivity for higher amps, gold is the better choice here as evidenced by the act that better mice almost universally use the 01. Now before you rush out and look for a -F, there are considerations here and it's really not that simple. Switches have a max force rating which happens to be based on the switch and is typically 10x the actuation force. So if you tend to abuse your mice, the non -f can actually last much longer. Just another reason for gamers to consider the non -F. As you start pounding the button for rapid fire, you can easily exceed the -F's force limits which is only a little over a pound. This becomes more relevant in the next section. Remember I said lifespan on the -F was irrelevant, now you learn why. There is a rumor that Japanese switches start with a lower lifespan and that the -F has a longer lifespan. This doesn't seem to really hold much water when you consider that Omron themselves labels them for you. Sometimes. Warning: Keep in mind that these numbers are without any load, and they really do mean ANY load. If the mouse button rests on the switch button or your finger causes it to, then the lifespan will be shortened. Anything touching that button shortens the lifespan. Your mouse may have some slop to prevent this when your fingers are off the mouse, but as soon as you put them on it, the lifespan is probably starting to drop as the weight of your fingers remove that slop. Personally, 10M last longer than 20M for me, see my note here. Unfortunately, the only surefire way to know for certain is with the part number as shown above as they didn't always mark them. However they often coincided with the button color or a painted dot on top. Some of the lower numbers the details are sketchy, but we don't really care about them anyhow. The colors are also referred to as tops, so when someone says a “white top” Omron, they mean it's a switch rated for 20mil. Presses. Caution: I don't recommend relying on the button color. MS has custom switches made for them (labeled MS) which can be different and I have seen white and gray botton Omrons with no (XXM) stamped on them. These are usually older models, but it's something to keep in mind. Dots and labeling is the only surefire way to know and a while lower numbers may not say it, you can bet a 20M is going to let you know it's a 20M. I'll put a chart at the bottom showing what is using what that I know of and if others post I will try and add them. Frankly, you do not want any of these on your switch, as they pertain to the soldering terminals and different ways to actuate the button, almost none of which are useful to use. Note: Levers can be removed, so if you want a specific switch in a hurry and can only find it with a lever, you can always remove it from the switch and use it without problems, just be careful removing it. Note: I do not know if the D2FC-3-7 exists, but I believe it might since the 7N has a Japanese and Chinese counterpart. A quick Google search turned up nothing. Almost all use a D2FC-F-7N the difference is the lifespan. Logitech - Typically uses Omron 10Ms in most of their mice, however some gaming have used 20 lately. Not all Steelseries use Omrons! I'm in the 01F camp because it is the Japan switch with the Thin-est spring. I prefer as light a switch as possible.. The D2F-F should be more rigid, because that spring needs to be thicker to handle the higher amp rating. Therefore it behaves less like a spring, and more like a lever.. In the end ,, preference..
No, as per Omron, current has to do with type of spring type or spring coating (01), not spring pressure (-F). I know that silver tarnishes which is why it wouldn't be good for low voltage applications. It seems to be consistent with their choice of gold-alloy for the 01F.. But you're saying this whole thing doesn't influence the thickness of that spring ? The majority of the metal here is still copper though.. I don't see why they even need to plate it..
Silver tarnishes just like copper..
Well, maybe next time I'll buy some D2F-F, and take it apart to check. Silver needs a secondary element to make it happen, sulphur is the most common and it's found in eggs and mustard, which is why tableware tarnish. Copper will tarnish and oxidize simply from exposure to air and moisture, work with it a teeny bit and it's shocking how fast it does it, especially when exposed to heat. The tarnish on silver is also easily removed compared to the carbonate that copper forms, simply operating the switch should keep it relatively clean provided it's a silver to silver contact. Not so with copper. Thanks for this information, good to see the data in one place. I got here naturally because I needed to replace switches for my Steelseries Sensei RAW. Just a couple of things: I presume the above was a typo - it confused me for a bit but I guess you meant D2FC not DCF2? There is one switch I can't find here or what / where to get. This is the micro switch for the scroll wheel. It's a square format maybe 5-7mm and from what I can see has no markings on it. On my mouse this is the one I really need to replace as it's stopped working. Any ideas what they use for this? Good catch, it's now fixed. The switch you are talking about is a Panasonic switch (based on pictures of the Raw torn down). Omron makes something similar (and 4x the cost) called a B3M-6009 tactile switch, scroll down on the link above and you will see that they interchange. Don't rush out for the Omron thinking it's any better. Those square switches are mushy.. Brilliant! Thank you, hopefully I can get one in UK or ebay. I see the switches I have in the RAW (actually a badged version) are 10M rather than 20M not that I'm bothered too much. I will probably change the lot and I have a second one in service which I had bought cheaply so I broke that one out to use, so no great hurry to get the old one back up and running. It's curious that Steelseries decided to use a possibly less durable switch for the scroll wheel but I expect (as in most cases) it doesn't get as much action as the others do so they figured it'd probably last as long. It's the first to go in mine though as the other switches are all are fine. Check Ebay.com (not U.K.), there is a person in the US selling the Panasonics for $2.25 each, I think it was. I've got a few with 10m and a few with 20m, and I'm convinced the 10m can take more abuse. And yes, they use them because they suffer less abuse, I've never killed a wheel button. Thanks, yes I hardly used the scroll button - certainly never on the desktop applications but I had a couple of games that made use of it extensively so this probably took it to the end of it's life. I've found the Omrons on ebay but also I see the equivalent to element14 here are Farnell.com and they do the switch. 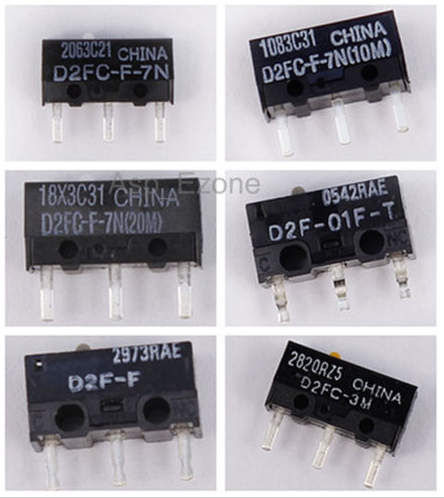 Judging by their postage I thought I'd maybe order the Omrons from them but they don't do the D2f-F-7N and I note your comment on fitting the Jap vs Chinese switches. The seem to do a slightly different range. Maybe the D2F01F is the closest I can see that may fit the bill? Just took off the top section to check the switches used for the side and top. I hadn't unscrewed this board yet. Looks like the switches on these are TTC and the legs are right angle. They look exactly the same size and so I expect interchangeable but I don't have any other markings on the switch to check. Another Panasonic in the middle for the toggle. The D2F01F should probably work. IF your button has a bit of slop, almost all of them do, however it will probably not last as long since anything resting on the switch will shorten the lifespan. No idea on the other switches. Recently got some huano switches.. Man these things are LOUD.. extremely bright sound.. I like the D2F01F better because it's much less annoying..
First of all thank you Leslieann for doing so much research. Atm I have a mice on my desk which uses two D2FC-F-7N(10M) for the main buttons. But differently than expected the case has a white button and no clear point in any color. So this mismatches the information you have given. Another points is the "Machine switch Numbers". As far as I understood your writing the machine versions are only for component placement systems while the others are for the "retail market" so to say. Anyway what does your sentence "D2FC-F-7N is Comparable to D2FC-01F" mean in that context. Are these the same products differently labeled? My Logitech M705 Marathon originally had Himake switches before I swapped them both for Omrons after one switch started double-clicking. The Himakes lasted me many many years though, so I have nothing bad to say about them. Yes, I believe they are the same product, just packaged differently for ease of machine installation. See how these resistors are assembled in a batch for a machine to install them, same thing, but a strip of switches. They do similar with capacitors and leds, so why not switches. Keep in mind, this is just what I suspect based on the evidence I can find, I have no hard proof of it as trying to track down OEM supplied D2FC-F-7N isn't easy as the internet has become so polluted by people trying to locate them. The best evidence for this comes from Asus, the Spatha mouse comes with D2FC-F-7N's pre installed (it's done by a machine) but the spare switch they ship it with are D2F-01F, which was meant for hand assembly. And yes, I do find it odd they use Chinese internal, but Japanese for hand, it probably just came down to source and convenience. The company doing assembly probably has pallets of 7N's in strips ready to go, but someone had to source the individual switches to include. As noted above I found some info about the Asus Spatha mouse which sort corroborates the machine info, but also led to me finding more info about the 7N switch, which apparently comes in both Japanese and Chinese flavors. I also added a bit about the 3-7 switch, basically assuming that it two has a Japanese and Chinese counterpart. I have found that at least in my case, that 20M switches are not as durable as 10M switches. While this at first runs counter to Omron, if you remember when I said resting your finger on the button shortens the lifespan, it's possible that the 20Ms are more easily damaged. So while a 10M may be rated for 10mil clicks, resting your finger on it may shorten it to say 9million clicks, while resting your finger on a 20M may shorten it to 5mil clicks. In all fairness, this could just be a change in my use pattern, a change in Omron's production or Logitech's production as the 20s are a recent change for Logitech and their manufacturing has changed so it could be the supplier. Hard to say, but so far I have not been impressed with 20s. Logitech has the little H shaped plunger bar to reduce over-travel.. Whereas many other mouse housings do not. like microsoft wmo.. it's just a straight piece.. So if you're comparing , that should be taken into account. where the H bar would increase the durability of the switch regardless of the switch rating..
OR perhaps that switch rating was only possible using logitech's h-bar.. as in the other way around..
We're never gonna really know because we can't test this. Actually Microsoft has a special line of switches from Omron (marked with an M or S, I think), however that isn't what I was referring to. Warning: Keep in mind that these numbers are without any load, and they really do mean ANY load. If the mouse button rests on the switch button or your finger causes it to, then the lifespan will be shortened. Anything touching that button shortens the lifespan. Your mouse may have some slop to prevent this when your fingers are off the mouse, but as soon as you put them on it, the lifespan is probably starting to drop as the weight of your fingers remove that slop. Personally I stopped caring about what type of Omron is inside of any mouse model. If the mouse initially feels good then I leave things alone BUT if the button feels soft or no click is present when pressed numerous times, then it's opened up to replace the unruly beggars inside. Of course due to my hands and fingers I'm incapable of handling such tiny buttons with solder and cleaning, so I let my niece do the removing of the switches and soldering new ones in. She has in fact saved a lot of mice from the bin and I have to say you youngsters with long and slender fingers are well worth your weight in Gold. I have found that at least in my case, that 20M switches are not as durable as 10M switches. Do not bother with chinese Omrons. Japanese Omrons are rated only as 1M click, but they have much sturdier structure, so they will outlive any of the 10M-20M switches. On my last MX Revo mouse I swapped the standard chinese swithes to D2F-01F immediatelly. That was 5 years ago, mouse is still in great condition. The D2FC-F-something switches in my previous 2 MX Revos haven't survived till their 3rd birthday, both failed after 2.5 and 2.75 years. Also I don't like the sound and the feel of the chinese Omrons. Small notice: japanese Omrons have 0.1mm taller stem, that can be a problem on non Logitech mice. Razer users have complained about the extra tension on the mouse top. BTW, Logitech used D2F-F switches in their high end mice 20 years ago, meanwhile their OEM mice used noname switches like Huano or Zhij. They abandoned this habit in '99, since then all mice are manufactured with various chinese Omron D2FC-F-s.
My friends and I had 3 MouseMan+ mice with japanese D2F-F switches, first switch failure occured after 4 years, 2 other mice worked for 5+ years. Before I went shopping thought it might be a good idea to check the switches in my CM Inferno are compatible. 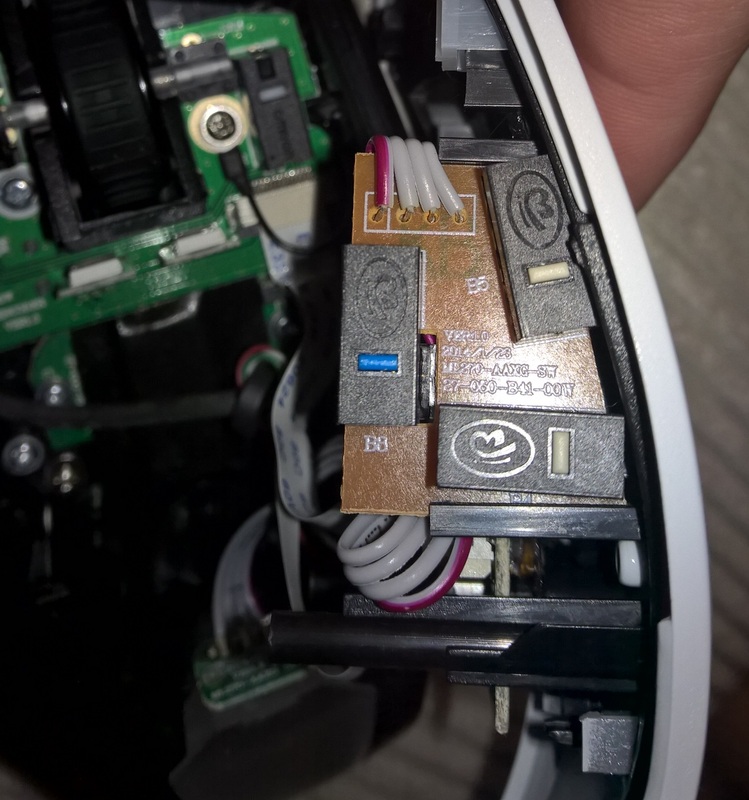 They are marked ZHIJ so looking at this pic (of a different CM mouse) with one next to an Omron it looks good to me? I was surprised to see both failing switcbes are red (there are greens in there too) as left click gets way more use but middle has been failing for months and left only started playing up recently. Needless to say this is not usable so it's repair or replace time. Keep in mind.. nyunyu-- is a biased, japanophile..
Tp4 am the largest proponent of D2F-F japan, , I use them in all my stuff.. 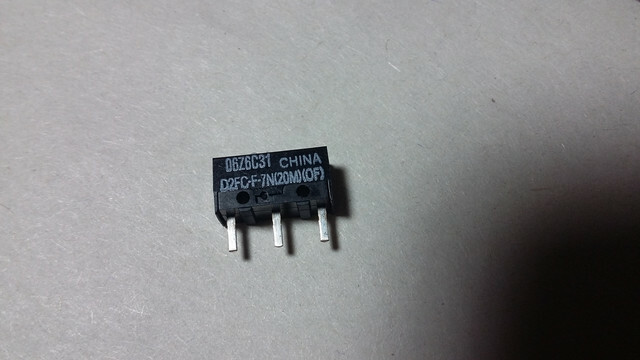 However, I've personally worn out only 2x D2FC-7N (China 20mil), switches. I've also worn out 2x D2F-F (japan), switches.. So, these personal experiences are by NO MEANS a true assessment of the reliability of the switches.. In general, the only validation is done on the side of Logitech, as they ACTUALLY TEST the switches to 20 mil clicks.. which takes months.. I definitelly remember, that my first MX Revolution ('06) used regular D2FC-F-7N. Seems like the older chinese switch is made of pure uncoated copper, the newer (10M) one has some coating, just like the japanese. 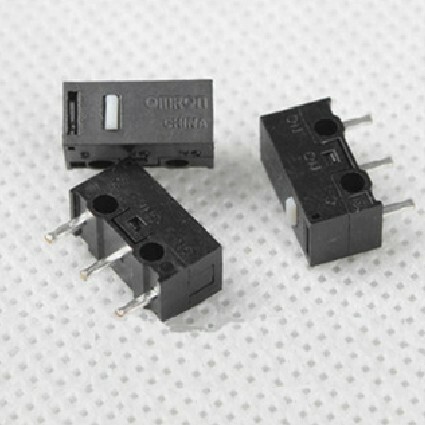 The coating on the regular japanese switch is darker, contains less gold than the coating on the low-current -01 series. I'm not sure about the button color theory in case of Omron switches. 3M rated chinese Omrons found in some Razer mice had red buttons, but all others have gray or white button, depending of the origin. BTW, I have seen a very different chinese Omron switch in Gigabyte mice several years ago. Their housing was almost exact copy of the japanese Omrons, but had "Omron China" written on the top, and D2F-J01F was the model name. Hmm, I found my old MouseMan+ mouse (bought it in 98), it has red Omron D2F-F-3-7 switches under the main buttons, and Cherry DB2 as side button. Well, those "3M" rated switches lasted far longer, than the default chinese Omrons found in my MX700, MX1000, MX Revo mices. Oh, I entirely agree, I wouldn't swap out working Chinese Omrons, but if I have to replace them, they're getting Japanese switches. The price difference isn't a big deal and even if it only buys me even a few extra months it's worth the money to save the effort. Wow, very informative and useful, thank you! I need to replace the switches on a couple of mice, but is there one in particular that's more quiet? Softer click is quieter, however, many people think they are less pleasing to click as a result. There are also some new switches that are supposed to be really quiet, however I haven't seen them, nor do I know if they are compatible. And what does N mean? The same as F? I'm going to repair my old A4 mouse just for fun. And i still don't understand if -F ones have longer lifespan (not for gaming). Cannot choose between D2F-01F-T and D2F-F-3-7, the latter is a little bit cheaper. It doesn't matter in terms of actual usage.... and I've not seen any OFFICIAL sources of the f37.. WHereas mouser / digikey sells the 01f.. so you know it's legit.. But imho, if your mouse WORKS, there's no point in doing swaps.. The fact that your A4 mouse has them, it stands to reason N is NOT Japanese as there is pretty much zero chance your A4 mouse has Japanese switches. They would probably double the cost of making the mouse (not joking!). Which confirms my theory that the N stands for soft springs. As for lifespan it has nothing to do with the spring rate. Newer switches are printed (painted), older switches used a colored dots or plunger. Sorry for misleading. It's A4tech NB-90 wireless/battery-less mouse. I have random double-clicks, etc. 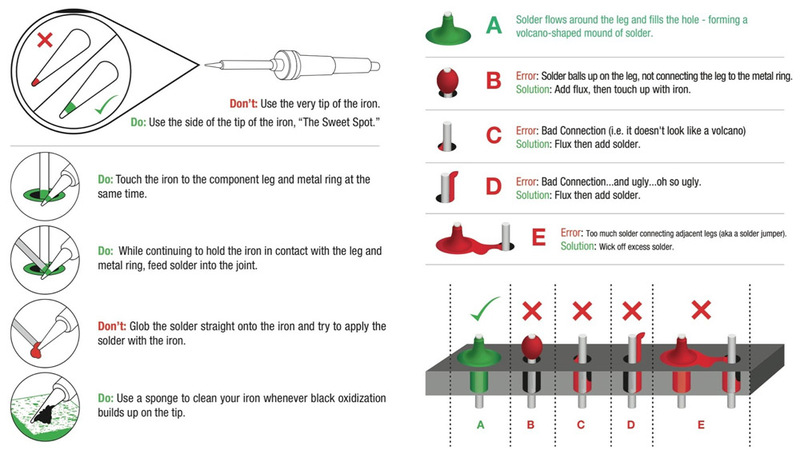 I've recently tried to repair its microswitch using this guide. It works but not for long i'm sure. I'll have to disassemble the mouse again to see which switches are used. I thought that most of them are interchangeable, aren't they? So. Am I right that i should install in NB-90D an Omron switch labeled with "-01". According to D2F specs these are 30V DC. 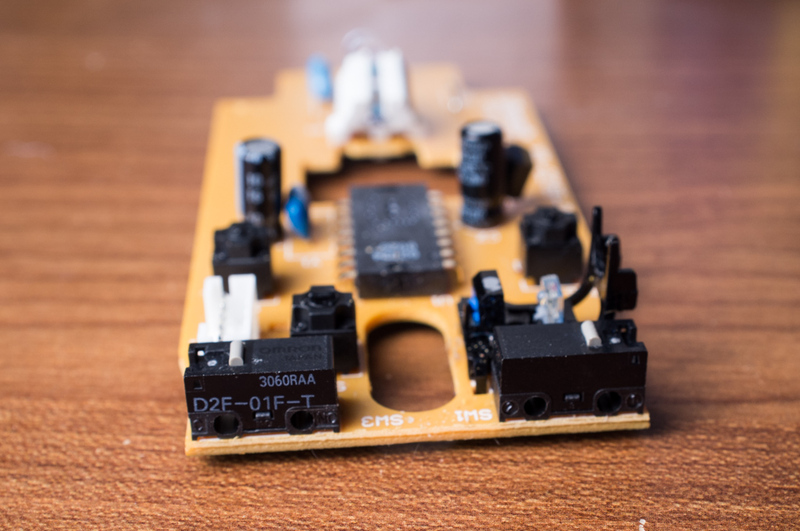 For repairs, check out my WMO mouse guide, it contains detailed soldering instructions for these switches... Timing and procedure is very important. That guide you followed is complete garbage. You aren't going to re-bend a spring and have it function right ever again. It may for for a short time, but the spring is no longer in spec and will fall back out of of spec again. The spring is compromised structurally and each time you mess with it, it's lifespan will get shorter and shorter. As for the switch, quite a few mice (especially smaller or oddball) use Panasonic style switches, so you're going to have to dive back inside and see what you have. Don't assume they are Omrons, especially in a lower end mouse. Companies who buy out of Chinese catalogs, which I suspect A4tech does, are even more likely to use the Panasonic or even something more off the wall as Chinese companies come up with some really odd stuff. Both A4Tech mice i have use Huanos. They look very similar to Omrons. And "Panasonic style" square switches A4 uses for additional buttons. Could you please answer the question about specifications in my updated post? There's really no documentation telling how to go from Huanos to Omrons interchange, there may be measurements from Huanos somewhere but if there is one thing I learned researching this is that documentation is lacking. Design-wise, these match the Japanese switches, however, without a micrometer it's impossible to eyeball, so you will need to just install and try them, if they are super sensitive, then it needs Chinese switches rather than Japanese. If you want to try Japanese, you want d2f-01, for Chinese, d2fc-01, keep in mind, it wouldn't surprise me if it originally has soft springs (d2fc-01f). you'd have to cut the legs off the switch in order to get it in there..
Actually, I meant to say digital caliper. As for the switches and precision, you're measuring plastic, clipped together, and then soldered onto a plate... You aren't going to get machinist precision, but 0.1mm is more than enough for what we need here. You don't have to worry about SPECS besides the resistence, the force.. because it's all 5v, and there's no Current restriction because this isn't in line with a power supply, it's a signal line. Since most popular gaming mice use Omron switches, the information you gave is a godsend. Thank you TS! This is some great reading material, thanks for gathering it all up. I replaced the switches in my MS Optical based on TP4's how-to and it was a vast improvement going to the D2F-01F switches. I asked ebay seller about d2f-01f-t ($4 for 5pcs) And they answered that it is made in China. Strange. He's just reselling, he doesn't know, or care. Note in the pictures that the Chinese models all have a C in the model number, as well as China stamped on them, but they also have smaller cross holes. They were manufactured under Omron's license by a chinese company, and Gigabyte used them in their mice ~10 years ago. Ahh, it's an older one. By the way, I looked it up, the switch has China embedded in the top surface (I.E. clearly labeled Chinese if viewed from the top down.). I'm sure this and fakes coming out of China are why Omron changed their labeling, older ones were difficult to make heads or tails from. Logitech started using D2FC-F-7N series around 2001 (MX500/700 already had them in 2002), so the D2F-J01F is actually newer model. Older as in pre-dating the current labeling system. I actually like the feel of the Logitech gaming mice as opposed to the Razer ones. Not that I am a fan of the said company, but I just like the feel of the mouse buttons. Even though they're both using the Omron switches, I just feel that the Logitech G502 that I have has a softer feel to it in every mouse press. IDK if razer does it, but logitech will feel more shallow and lighter because the prong which contacts the switch has a specific h shape, where the bars prevent overtravel in engaging the switch. I recently bought 10 OMRON "D2FC-F-7N (20M)(OF)" switches for my ASUS ROG Gladius Mouse. I know that 20M is 20 Million click lifespan. However do you know what (OF) means in paranthesis ? not in the spec sheet . don't know. I have no idea, but can only assume it's a special batch made for s company, for example, the spec sheet doesn't list the "M" variant of the switch which is made specifically for Microsoft mice. What do you say about this new one? I am no expert on OMRON switches but I think these blue buttoned (50M) ones are very stiff. Where do I know ? Well, my Asus ROG Gladius mouse has those switches inside for the "Forward" and "Backward" buttons. They are blue buttoned and very stiff to press. I think it's the tradeof for such a high lifespan value. While researching the OF and K switch, I found a little documentation on the D2F-F-7N and confirmed that it is a 75g (low spring pressure) switch (this info has been added to the guide). Still not sure if the number refers to assembly line packaging, but would make sense as Omron also builds automation lines. As for the K switch, apparently these have been nicknamed "blue dots" and are being touted as a 50m direct replacement for the the D2F-F-7N, including spring pressure. Remember, you are used to operating these with a lot more leverage, so a brand new switch in your hand will feel very stiff, that said, the documentation claiming these are a direct replacement for D2F-F-7N comes from Chinese sellers and as many of us are well aware, some of these guys will tell you it folds laundry and makes you meals if they thought it would sell you on it. So there is no trusted source regarding this K version? And what about the mechanical\electrical lifespan variation? You only need to worry about lifespan if you have the proper soldering equipment and technique..
Because I've noticed that most people are putting in these switches outside of the proper soldering guidelines.. Check my WMO ultimate thread below for soldering guide for the omron switches. I actually did read the guide to properly soldering the OMRON switches and soldered accordingly, so I don't think this is an issue atm, but thanks! Because this is (what I assume to be) a machine assembled, bulk ordered part, Omron won't just hand out documentation on it as they don't expect the general public to need it. As for lifespan, it's right on the side of the switch. keep in mind that number is marked assuming non- full travel, as in the switch will be actuated but not be pushed all the way down.. In certain mice like mx518/ g400, the button flap which goes over the switch in an h shape to prevent over travel..
in mice like the microsoft intellimouse, it's a flat bar which goes full-travel to the bottom out the switch.. So in theory , the same switches will last MILLIONS of times longer in a logitech mouse vs the microsoft intellimouse.. IN THE END.. this number simply doesn't matter to the end user, because replacement is cheap. Agreed, the number is almost irrelevant, but not because of price (ever try changing one in a G700? ), but because lifespan is much more depending on how you abuse it, which is ridiculously easy to do. My apologies if this post is in the wrong thread, but it's my best guess. I have opened up my Corsair M65 Pro RGB to have a look "under the hood". So I did find the expected D2FC-F-7N(20M) switches as the main buttons. However, the buttons on the side (the ones you click by using your thumb) show no model or brand name except for a logo. I tried a "reverse image search" of the logo, but I come up empty. Are these also Omron switches? And if not, does someone know what I'm looking at here? However, they're probably just as good..
Omron's patent is out on this switch, so they've been thoroughly cloned by many many other manufacturers..
KEEP IN MIND, there is nothing special about official omrons..
We'll assume they have somewhat stricter quality control.. but, even then, the manufacturers of mice are only using them because they're afraid of people like me making threads about Not getting omrons on the internet..
Omrons are not god, it's a mechanical item which can easily be reproduced, especially when a patent and tech documents give all you need to copy it. If they are working and you don't hate the feel, leave them alone. These switches are actually quite delicate to pressure and heat. If they are damaged, swap them with what is there or the equivalent Omron. All I can say is thanks for this insightful thread, I always wanted to learn more about mice switches! I has a couple gaming mice where the switches were acting up, but I never know which switches I should get as a replacement. This will definitely help! Oh of course! They work fine. And I can imagine they might take "cheaper" switches for the side buttons as in general I assume they are not used as much as the main LMB and RMB. It was purely from an information perspective that I wanted to figure what switches they used in this area of the mouse, because I'm doing a review of it. I got some new empiric data on the durability of the d2f-01f-t: 6 months of hanzo gameplay I'm about to swap them to new ones since the button cuts the circuit before the click while releasing pressure. (on the previous page) i ordered d2f-01f-t but they sent me d2f-f.) though the pictures of these two were mixed up on that ebay page. It is really made in Japan. At least there's "omron japan" title. Mouser or digikey is the place to get official..
Next time you do it.. make sure to get a solder sucker, and get the old solder off first..
And I saw that Logitech claim that they use in the new G903 (vs the G900) a new switch which lasts 50m click (vs 20m in the G900). Do you think this is legit? The 50m would only work in mice designed specifically to minimize overtravel like logitech's. If you put it in a Microsoft Wheel mouse optical for example, which always full travels on the click, it would never even get close to 50m. What's overtravel? What's full travel? Am I better off with the regular 20mil in the G900 or is this 50mil version better? If you have a regular g900, stick to the orginals unless you know that the dimensions on the new 50mil are the same, the travel characteristics especially have to match. Both the mouse buttons on my G900 died the same way, they lost their click and the weight of my finger would actuate them. I broke it down and it uses D2FC-F-7N(20M). I call BS on that 20 million claim. I replaced them with japanese D2F-F switches, rated at 10 mil since they feel tighter and snappier than the 20 million switches. Regardless the D2F-F Japanese gray switches feel better than this mouse has ever felt. Make sure when you replace the switch you make sure the switch is pushed all the way in bottoming out in the daughter board, as the tolerances are tight. If it broke on you, in what you consider TOO EARLY.. You're at fault for clicking too hard. The rating is @ 0% over travel.. it is not a real world use rating. Meaning if you pressed it down PERFECTLY to the point of actuation and let go. If you press it down any further, the number of total possible presses decreases "Exponentially"
This is the nature of mechanical tolerance.. It has nothing to do with China vs Japan. Those switches are rated by Logitech internally, They're the ones that give go ahead on the 20M labeling, so when they say 20M, they mean 20M, but again, it's under very SPECIFIC testing conditions. NOT real-world conditions. I responded in your other thread as well, but suffice to say, these are not cheap switches. Worse, the switches you installed are pretty much the exact same switch. Why does it feel better? Because it's not damaged. However, Logitech does independent testing to verify it before they used it on their packaging. I also prefer my logitech g502 compare to razer deathadder. i used razer deathadder for 3-4months and start chattering and g502 for 1.5 years without problem. but i think it's also very common problem with switches. however, I'm most likely heard razer mice chattering than logitech. not sure why. It has the Deeper travel like the D2F-01F, but it has a bright clicks like D2FC, even slightly brighter. Can all switches work in any mouse ? Kind of... There are d2f switches with bent pins to sit at an angle and levers and wheels on them. However, the d2f body is a standard size, everything else is either internal changes (lifespan and spring pressure) or external (bent pins for sitting on it's side or has a lever attached). Basically, if it's a d2f and looks correct, odds are it will work, even if it's not a 100% perfect match. Hello guys. Im having a problem with middle mouse button on my a4 tech bloody, that is too hard to press. Im thinking of replacing it, but as i can see from YT, those are not standard switches, but little bit taller (maybe japanese, or with some kind of plastic base.. idk). So does anyone recognize those switches, are they standard and can i find it somehere? (softer version of it). I dont want to tear up my mouse and void waranty to find out that is imposible to find replacement. Thanks a lot. If it IS a little taller, just fold printer paper in 4 folds, then cut little pieces the size of the switch. Then you put little holes where the copper legs go into the paper using a mechanical pencil 0.5mm. THEN, you put the little papers under the switch until you get the right height..
Each piece of paper is ~0.1mm.. if you have a digital caliper, this is even easier to get perfect.. it's ~ $10 for a cheepee. Don't worry about accuracy, even cheepees are accurate within 0.1mm..
Just tie the switch with a twist tie to the pcb while you solder the first 2 legs on the outside..
Then remove the twist tie, and solder the middle..
Actually, I wouldn't be surprised if the base is just that, a base that slips over the pins, which based on the pic, are probably long enough. Probably. That was listed in my sources. I know sponges are pretty common to clean irons, however, it can also cause micro fractures on the tip. It's not likely to break, but will cause it to be harder and harder to keep clean, eventually needing replacement. What some do is clean it with brass shavings, and then if you want to protect it, apply fresh solder before putting it away. I don't always go that far, but my tips have lasted longer since I stopped using sponges. Grab some brass wool or wad up some copper mesh, and shove it in a can or into your soldering iron stand if it has a place for it. When you need to clean the tip, just stab the wool. It comes out as clean as wiping on a wet sponge, but your tips will last WAY longer. I recall this had to do with water and rapid cooling, it's not the sponge's fault.. Seriously, it's AMAZING the difference. We had a Weller station of some sort, using a sponge we averaged a tip every month, month and a half. Then the Weller died, support for them has gone to hell, so never again. We bought a Hakko 880 to replace it, the first month or so we used the sponge and killed that tip. We stopped using the sponge and have not killed a tip in a year, we even bought a second 880 and have yet to kill a tip on that as well. We actually lost the spare tips we had because we stopped needing them. Just wanted to give you another data point: my (now quite old) Logitech G500 indeed has a "D2FC-F-7N(10M)" pair of Omron switches. I'm discovering this today, because it seems like they've finally reached their usable limit--not too long after having to fix the infamous "cable break" bug at the connector . I took some pictures for posterity, if someone wants them. Still using G500 , that's pretty dedicated after all these years.. I'm using mainly my ergopwn 9000, and a g403 on the side. Page created in 0.294 seconds with 161 queries.